Been back in Bangkok the last few days, found a cheaper room on the khao san road for 600 baht a night, not quite so easy to be anonymous here. So many younger tourists and mostly westerners, but at the same time its loud and drunken, which as you know isnt quite me. But met up with Jackson, an american I met on my halong bay trip, so at last have someone to see stuff with, which is really nice. 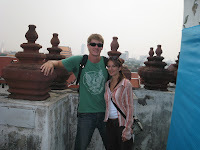 )Picture is of us atop a temple). Seeing temples is great, but sharing the experience with someone is amazing. Jackson is great company too, he knows a lot of stuff and is very intelligent to have a conversation with (he lectures in international relations in australia and is currently touring asia as part of his studies). Trying to figure out what to do next, my visa in thailand runs out on the 20th so I have to leave the country (or get an extension). I was thinking of visiting a buddhist center on Penang- a malaysian island, but the next step isnt yet clear to me.